Mitsubishi Delica Owners Club UK™ :: View topic - First recorded car death. Mitsubishi Delica Owners Club UK™ Forum Index -> Oddities to be seen in the UK! Posted: Fri May 11, 2018 20:26 Post subject: First recorded car death. This sign is to be seen at Harrow on the Hill, junction of Peterborough Road & Grove Hill, N.W. London. I had to take this pic at night - Two reasons = Yellow lines on the roads, and I'm not in Harrow during daylight hours. Posted: Fri May 11, 2018 20:26 Post subject: Google Ads keep this community free to join! 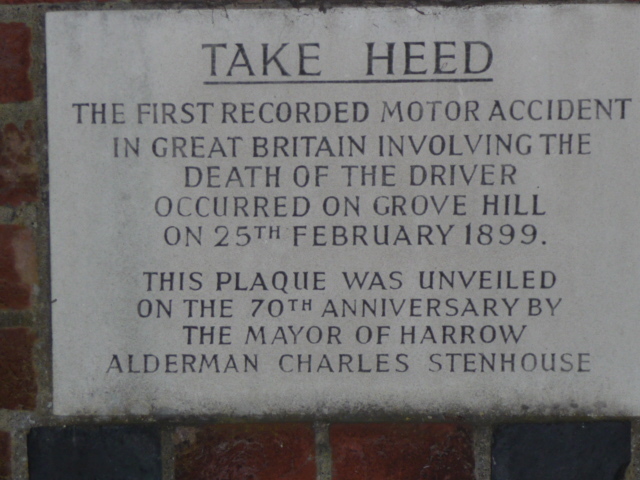 On the 25th February 1899, Edwin Sewell and Major Richer were thrown from their vehicle on Harrow on the Hill, Middlesex, London, and killed. Sewell's death was the first fatality of a driver recorded. The driver, Mr. E.R. Sewell had been demonstrating the vehicle, a Daimler Wagonette, to 63-year-old Major James Stanley Richer, Department Head at the Army & Navy Stores, with the view to a possible purchase for the company. As they drove down the hill at 14mph, a wheel shed its rim. Both Sewell and Richer were thrown from the car onto the road. Sewell died instantly, and when Major Richer died four days after the accident without regaining consciousness, it became a dubious double-first; the first death of a driver in Britain, followed by the first death of a passenger in a motor car. Though in August 31, 1869, While riding as a passenger with relatives in an experimental steam car, Mary Ward was thrown from the car and fell under the wheels as it rounded a bend. This is believed to be the first recorded car passenger death. It took place in the town of Birr, which was known at that time as Parsonstown. The car was built by her cousins, the sons of William Parsons, 3rd Earl of Rosse. Birr, is that in Ireland Please excuse my lack of geographical knowledge - I do not travel outside of the UK mainland. Interesting that one of those sons of William was Charles Parsons, who went on to invent the steam turbine, which revolutionised the generation of electricity. My uncle and godfather, was at one time MD of Reyrolle-Parsons turbines in Newcastle, a division of Rolls-Royce. And yes, Birr/Parsonstown is in N.I.